“Turist” was the Closing Night screening of last years Viennale (which also means that yes, more than four months later, I’m finally finished with my Viennale-reviews! ), and while it had a nice, interesting concept, I wasn’t that happy with the execution. And when I say execution, I don’t mean the directing (which was fine) or the acting (which was top-notch), but rather the direction in which the story unfolds after that great, heart-stopping avalanche sequence, and the emphasis Ruben Östlund choses for the middle part of the film. Apart from the stellar acting, what I loved most about the film was the idea behind it. Even though the avalanche turned out to be ultimately harmless, it seemed like a dangerous situation, and the way Tomas reacted shatters Ebbas trust in him, and threatens to tear this family apart. I really loved this idea. We all would like to think that we would keep our cool in a potentially dangerous, maybe even life-threatening situation, and that we would put the lives of our loved ones before our own. But the truth of the matter is, none of us can know beyond doubt how we would react, until we find ourselves in such a situation. Something that I hope all of us will never experience, thus we’ll never be at risk of learning the awful truth that Tomas and his family have to learn about him. The question how they deal with this shocking revelation, and how – if at all – they can continue their life together after this incident, could have been really interesting and fascinating. Unfortunately, I didn’t really like the direction the movie took afterwards. See, in my opinion, the focus should have been solely on Tomas bolting from the scene. Instead, there’s this weird shift in emphasis, since Tomas totally denies (to his wife, their friends, and maybe even to himself, even though I don’t really see how that should work) having done that. Thus, the middle part of the movie is more about him denying that he left his family behind, instead of actually being about him leaving his family behind. Which in my opinion was far less interesting. Plus, it also made him look goofy. Thus, the middle part of the movie didn’t really do much for me. I also could have done without the typical gender roles that the movie brought in. “Turist” makes a big deal of the fact that he’s supposed to be the man of the family – as if it would have been any less worrisome if Ebba, instead of Tomas, would have left her family behind in order to safe her own skin. Finally, the lengths that they ultimately go to in order to try to leave this incident behind them and move on with their lives, didn’t convince me. I don’t think that you can cover up such a hard truth with such a blatant lie, and while the movie does suggest (with the bus scene at the end) that it probably didn’t really work anyway, I just can’t imagine people behaving in such a make-believe manner. It just didn’t ring true to me. Then again, I’ve never been in a situation like that, so what do I know? Ultimately, though, I didn’t feel like the movie lived up to its great, fascinating premise. 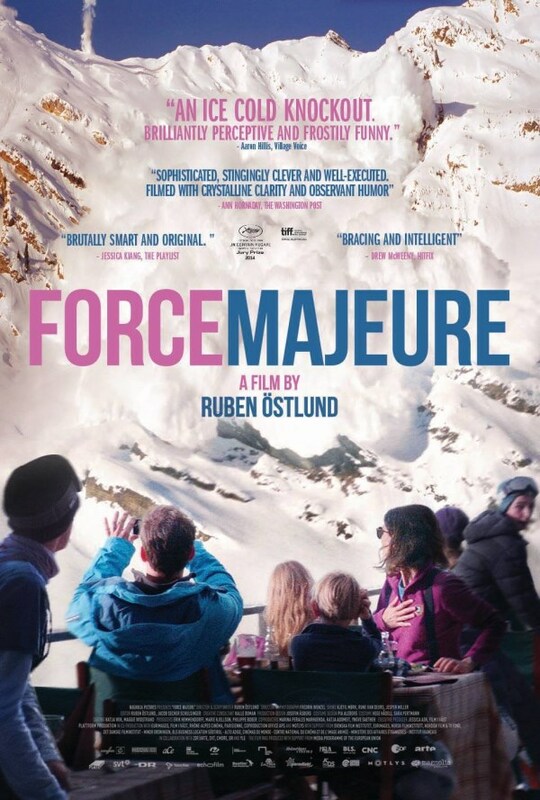 This entry was posted in cinema 2014, movie reviews, Viennale and tagged Force Majeure, Ruben Östlund, Turist, Viennale 2014. Bookmark the permalink.